There is a one-year warranty, and it is a cheap and problem-free product. This review is about item#3356726. I am worried because it is a general purpose but it is used without problems. It is big and the numbers are easy to see. This review is about item#3356683. At first I was fine but it broke down on the way. Not durable Somehow Monotaro san. Since it was a human being for a long time, although Pascal display had a sense of incompatibility at the beginning, it was treated as a problem of familiarity. This review is about item#03356726. I bought it for exchange with an existing one. I can use it without problems. This review is about item#03356701. 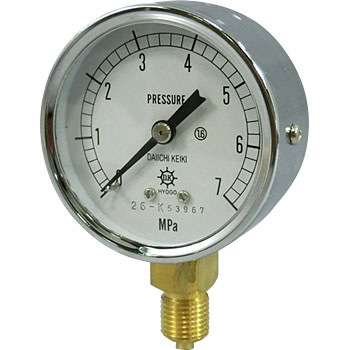 Use it as a gauge of hydraulic pressure. We are investigating durability, but I would like to price down. In one week after using it, the tip of the needle turned slightly downward. This review is about item#03356692.